This budget package, perfect for a gang of friends looking to experience the rafting adventure in Kolad, offers you thrilling activities at a riverside paradise. 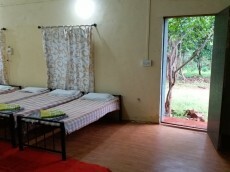 You'll stay at in large dormitory rooms at a campsite, located not far from the raging Kundalika River. 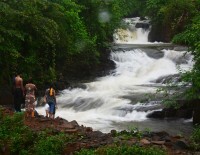 In the monsoons, the campsite is home to a river stream and a waterfall as well. During the day, you'll spend most of your time outdoors, eating fresh food and living the simple life. The best part of this Kolad adventure trip comes with the thrilling 2.5 hour session of rafting on the Kundalika! Apart from riding the rapids of the river, you'll also engage in other adventure activities at the campsite: Tarzan Swing, Flying Fox, Burma Bridge, wall climbing, tunnel crossing, wire crawling, and trust fall. 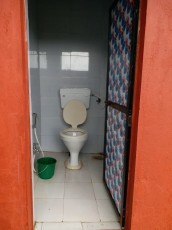 NOTE: This dormitory can accommodate up to 12 people. 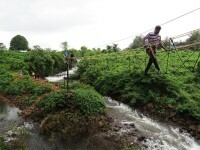 Kolad, a small village in the hills of Western Ghats, is famously known for rafting adventures on the Kundalika River. 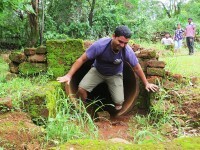 The village is surrounded by tropical greenery, with coconut trees and tree plantations lining the Kundalika River. Your campsite for this Kolad rafting adventure is not far from the river, with a small water stream running just behind the campsite. Winters at the campsite bring chilly evenings, making it the perfect destination for camping. You'll stay in a dormitory that can accommodate up to twelve people. 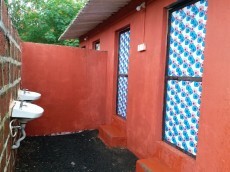 The dormitory comes with common washrooms and beds with blankets, bed sheets and pillows. The common dining area at the campsite will serve delicious buffet-style meals. Travellers younger than 14 years of age are strictly not allowed to participate in rafting. 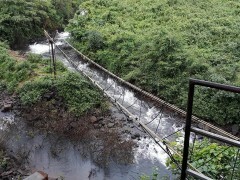 Consumption of alcohol, drugs and tobacco products like cigarettes is strictly prohibited during the Kolad rafting trip. For cancellations made on or more than 8 days before check-in date of the Kolad rafting trip: 100% refund. For cancellations made 5-7 days before check-in date of the Kolad rafting trip: 50% refund. 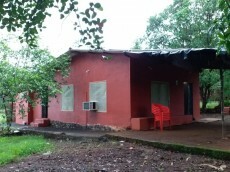 For cancellations made 3-4 days before check-in date of the Kolad rafting trip: 25% refund. For cancellations made less than 2 days check-in date of the Kolad rafting trip: no refund. Check in time is 16:00 hrs and check out time is 11:00 hrs. Room service is not available at the campsite. All meals will be served in the common dining area, opposite to the kitchen. 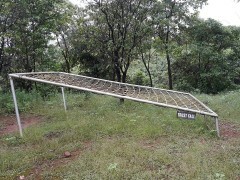 Rafting in Kolad is dependent on water released from the Bhira dam. The tour operator will not be responsible for last minute cancellation of the rafting trip due to inadequate or unsuitable water conditions. The tour operator takes utmost care to ensure safety of the travellers and shall not be held responsible for any mishap or accident while during the Kolad rafting trip. 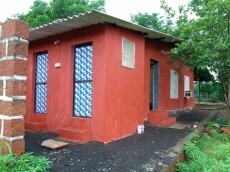 Day 1 of the Kolad rafing trip: Check-in and enjoy! You can check in any time after 16:00 hrs. Set your bags down in your dormitory, freshen up, and head straight for tea. After that, you can try your hand at the many activities on camp. You can even go for a swim in the pool, or walk down to the stream close by. As evening falls, you can relax in your private sit-out, spending quality time with friends or family. If you want an evening BBQ, do let the manager know by lunch time, so it can be arranged. In the evening, you'll eat a delicious dinner and retire to your dormitory. Overnight in dormitory at Kolad. Stay overnight at a beautiful campsite. You'll wake up early today and eat a tasty light breakfast. 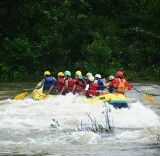 After that, you'll set off to the Kolad rafting start point for your whitewater rafting session. You'll be briefed by the instructor, and then the fun begins. After a couple of hours in the river, you'll be exhausted. You'll head back to the campsite and dig in to a big lunch. You can relax for a while, and then it's time to check out by 15:00 hrs. Trip ends here. Engage in a thrilling 2-hr session of rafting in Kolad. All equipment required for adventure activities: safety harness, fixed lines etc. Check-in at the campsite by 16:00 hrs. Today's meal package includes evening snacks with tea and dinner. 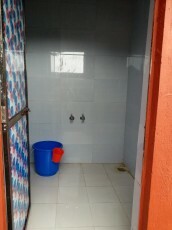 You'll be accommodated in a dormitory with common washrooms on twelve-sharing basis. 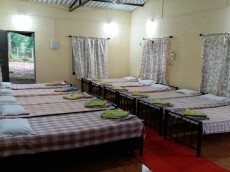 The dormitory has beds with blankets, bed sheets and pillows. Inside views of the dormitory. Today's meal package includes breakfast and lunch. All meals are served buffet-style at the common dining area near the kitchen. Check-out of the campsite by 15:00 hrs. Outside views of the dormitory.